The gothic literary tradition began hundreds of years ago with Horace Walpole’s The Castle Of Otranto in the 18th century. From then on, our fascination with the mysterious and the horrific has taken us from the page to the screen. It’s only natural, then, that the next medium for horror has become the art of tattooing. 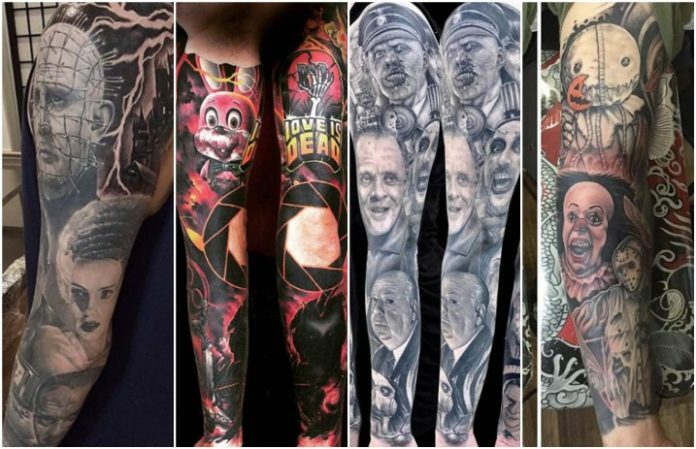 These fans have shown their obsession with and appreciation for their favorite masters of horror by getting these insanely detailed full sleeves. This black and grey photorealism horror sleeve is composed entirely of portraits, from the bloody Sweeney Todd to the classic monster of Frankenstein. The collage of fiendish faces spans the gap between old school flicks, straight up slaughter fests and even something as lighthearted as The Nightmare Before Christmas. There's a really good doc streaming on Amazon prime right now called Unearthed and Untold: the Path to Pet Sematary.. check it out if you're a fan of the movie! If you want top-of-the-line horror work, go to Paul Acker. Acker is famous in the tattoo world for his incredible photorealism and dedication to all things spooky and scary. This one pays homage to the screen adaptation of Stephen King’s beloved Pet Sematary. This sleeve is eye-catching because the artist chose its colors very carefully. The majority of the sleeve is black and grey, but there are pops of color that make the darkness come alive. Again, we have portrait work with some familiar faces, but incorporated in this sleeve also are the infamous Dracula and the ferociously fuzzy Wolf Man. These horror movie icons not only have their own movies, but also come together in Abbott and Costello Meet Frankenstein. In case you’re slacking on your film history, the timeless comedy duo actually contributed a lot to the world of horror cinema. Double the leg sleeve, double the fun! One sleeve shows a lot of love for horror, but two? This chick is as crazy as the movies she watches, and it’s awesome. Say hello to Chuckie, Annabelle and about 10 other majorly creepy characters.